Synonymous with the Greek summer, perhaps more than any other region of Greece, the Cyclades are one of the most popular holiday destinations. The Cyclades, the enchanting island complex in the Aegean Sea that took its name from the homonymous Nymphs, which Neptune transformed into rocks, according to mythology. The Cyclades is the most famous island complex of the Aegean and includes some of the most beautiful islands of the Mediterranean! The charming coexistence of white and blue in the Cycladic architecture, the traditional way of life, the island songs, the warm hospitality, the bare scenery with the scattered chapels, the stunning coasts and the exceptional sandy beaches make the trip to the Cyclades truly unique. Follow us on a once in a lifetime adventure and discover not only the famous islands of Santorini and Mykonos but also less known beauties for a taste of real Greece. 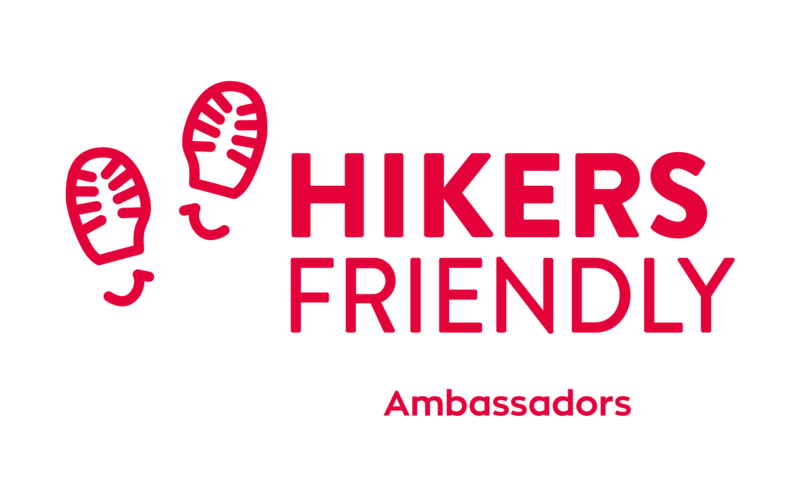 Santorini: Enjoy a hike up to ANCIENT THIRA and admire the ancient city with your private licensed guide. Tour starts in Athens/Greece. The tour ends in Athens/Greece. If you want to extend your trip, please inform us upon booking about your starting and ending point so as to be quoted the final price. Take your time to relax. In the evening you will have your first taste of Greece by strolling around the old neighborhoods of Athens, watch traditional dances and indulge into mouth-watering local dishes. We will take a half day tour of Athens and its most significant sights. 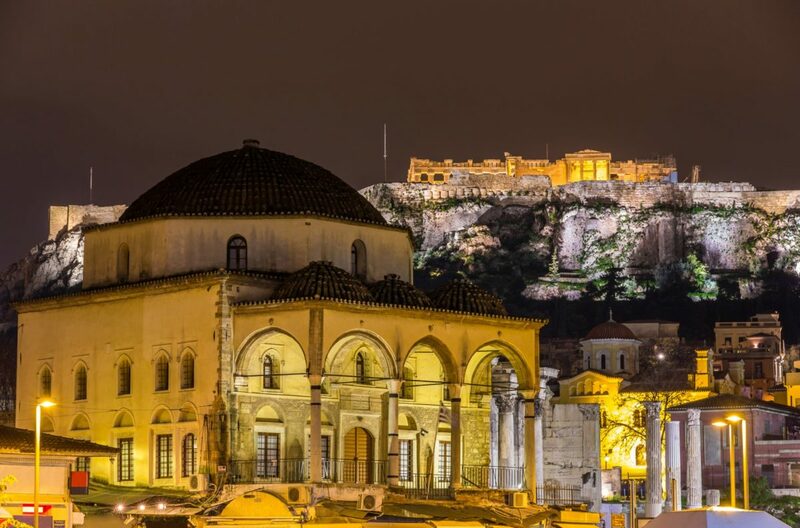 No visit to Athens is complete without a climb up to the Acropolis (“peak of the city”), where Ancient Athenians of the 5th century BC erected the great temple dedicated to the goddess Athena – the extraordinary Parthenon. You will also see the Ancient Agora, and some of the finest structures of modern Athens, such as the Kalimarmaro Stadium, home of the first modern Olympics in 1896; the old Royal Palace and today’s Parliament, with the elite unit known as the Evzones guarding the Memorial of the Unknown Soldier. We will have lunch in one of the most traditional neighborhoods, at a restaurant that only locals know and discover secret corners of this multifaceted city. 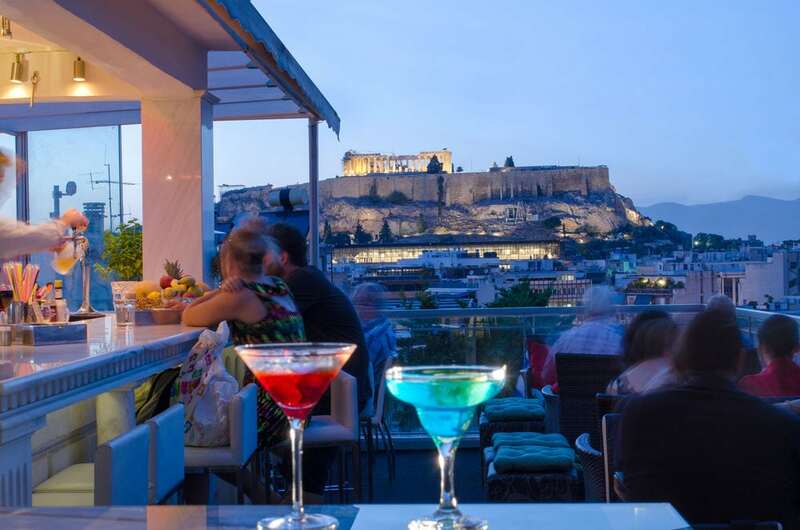 The evening is free for you to enjoy the luxury of your hotel, or go outside and why not dine with an Acropolis backdrop view. After breakfast, we will visit a tranquil countryside outside of Athens, where the temple complex of Vravrona lies, sometimes called, romantically, “The Parthenon of the Bear Maidens”, a sacred site of the huntress-goddess Artemis. Skipped by most visitors , solely because it is a bit out of the way, this temple is rarely crowded and stands by a delightful museum filled with images of the children who once studied at the temple – Artemis’ “little bears” or arktoi who danced for their goddess in sacred processions, making up for the death of one of her pet bears. The tyrant Peisistratos, hailing from Brauron, made the worship of Artemis the official faith of Athens during his ascendency. 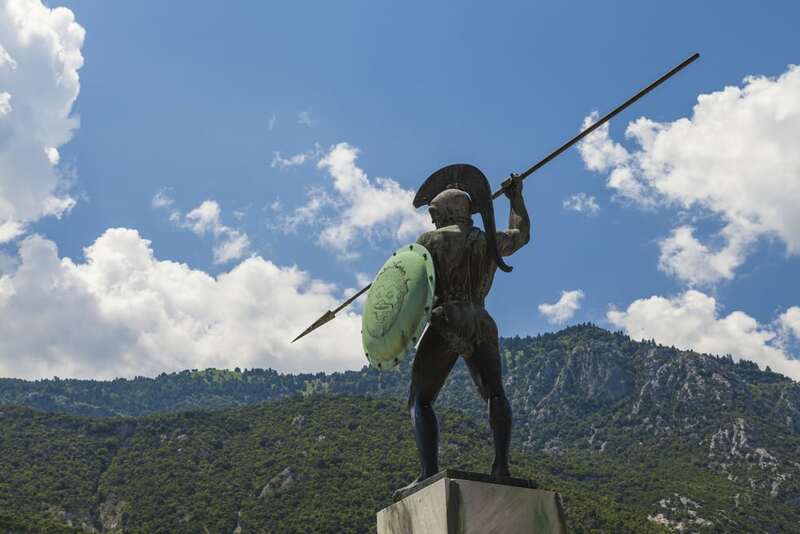 We will have lunch at Marathon Lake and walk through the area of the battle of Marathon and see the tomb of the 300 Spartiates at Thermopylae before we embark on a two-hour boat trip to Andros Island. Andros is completely different to all the other islands in the Cyclades. With its high and craggy mountains, deep, green and fertile valleys, its abundant running water, plateaus, terraced farmlands, steep coasts and the many large and small golden sandy beaches, this island is one of constant contrasts and surprises. Its perfect for gentle strolling, hiking or driving and within a few kilometers the landscape surroundings change dramatically. One moment you are in a dry, scrubby windswept area and the next in a forest of pines, or a wood of chestnut, plane and oak trees with the sound of running water babbling over its stony riverbed. You can move from the sunbaked sandy beach with the clear sparkling blue sea to green and fertile valleys or lush gorges which are rich with vegetation and flora. We will start our day in a traditional Kitchen.We will be given an introductory lecture to the cuisine of the Cycladic Islands and particularly of Andros. The island yields a bounty of unusual indigenous herbs and vegetables. 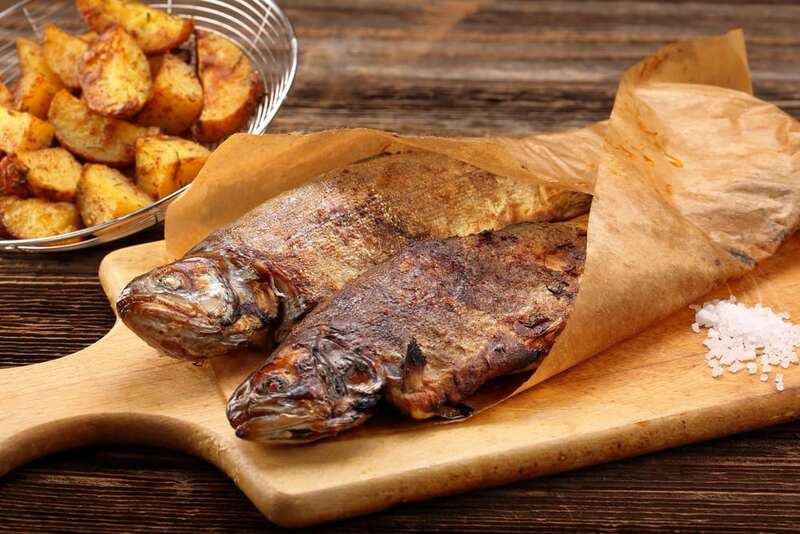 After we have prepared and cooked our dishes, we will be able to enjoy the fruits of our labors accompanied by a glass of delicious Andros wine or raki. In the afternoon you will have time to swim and relax or do some sightseeing in the island’s capital Hora. The best way to explore the island is on foot! Only in this way you discover the beauty hidden in every little corner, hear the birds singing, breath fresh air, and go on a small journey between past & present. We will trek a path of ecological and cultural interest and meet the unique nature of the island. We will visit old watermills, windmills, traditional olive presses, monasteries and archeological sites. We will end our four-hour trek with lunch at a village.The afternoon is free to enjoy the beach. After breakfast, we will take the ferry to Mykonos. Mykonos is part of a cluster of islands including Delos, Rhenia and some rocky islets. 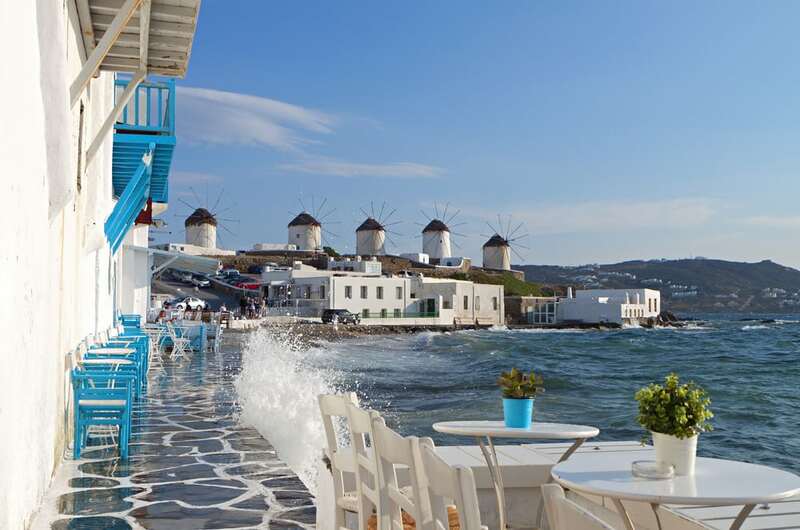 Mykonos, already inhabited since the 5th millennium B.C., has shared with them a long and copious history. Its intense tourist and cosmopolitan activity, which has continuously kept Mykonos in the foreground, inevitably reminds us of the cosmopolitan Ancient Delos during the period of its commercial peak (Hellenistic-Roman period). Despite the great tourist development of the island, it manages to maintain its Cycladic features and traditional look, like few other towns. Its cube-shaped, all white houses glow in the sunlight, scattered wisely and orderly in the countless labyrinthine alleys and streets with whitewashed cobbled pavements. A little further, on a low hill, the windmills, having stood there for centuries, compose a picture of unparalleled beauty in combination with the red domes and bell towers of the countless churches. In the harbor, a small colorful flotilla of caiques and fishing boats completes this unique picture with its vivid colors. A free day of relaxation and why not enjoy your luxuriously decorated room or villa and an outdoor hot tub with views over the Aegean sea. Late in the afternoon, we will have a Wine tasting tour and authentic Greek hospitality at an old monastery vineyard. After breakfast, we will embark on a sailing trip to the island of Delos. 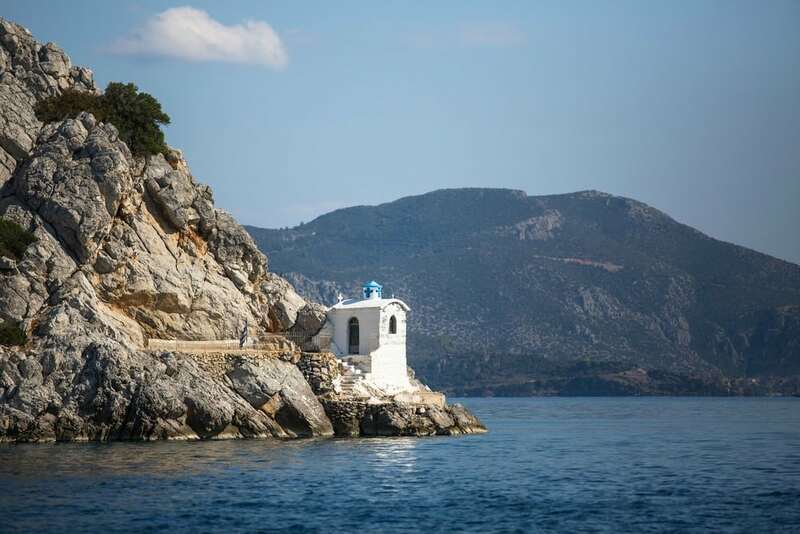 With the services of a professional guide, you will walk around the sacred island of Apollo and Artemis, a famous political and religious center of the ancient world. The whole territory of deserted Delos in one of the most important archeological sites of the eastern Mediterranean. You may visit, amongst others, the remains of the Temples of Apollo, the sanctuary of Artemis, the old city & amphitheater and then, walk down the celebrated Lion Street. Also, in the museum of Delos, you can admire Archaic, Classical, Hellenistic and Roman Sculptures, a collection of vessels from all periods as well as small items used in everyday life. Next, we will dive into the crystal clear turquoise waters of the uninhabited island of Rhenia, separated from Delos island by a small strait, and live this unique experience by enjoying the total calmness of the four solitary, sandy beaches. The evening is free at your leisure. After breakfast, our island hopping goes on by visiting the island of Naxos. Naxos is the greenest island in the Cyclades with impressively high mountains and fertile valleys. There are beaches that are among the most beautiful in Greece, a few minutes drive from villages where they still wear traditional dresses, weave on old looms and live off the fruit of the land. Naxos is an island of beautiful old churches, monasteries, Venetian castles and homes. 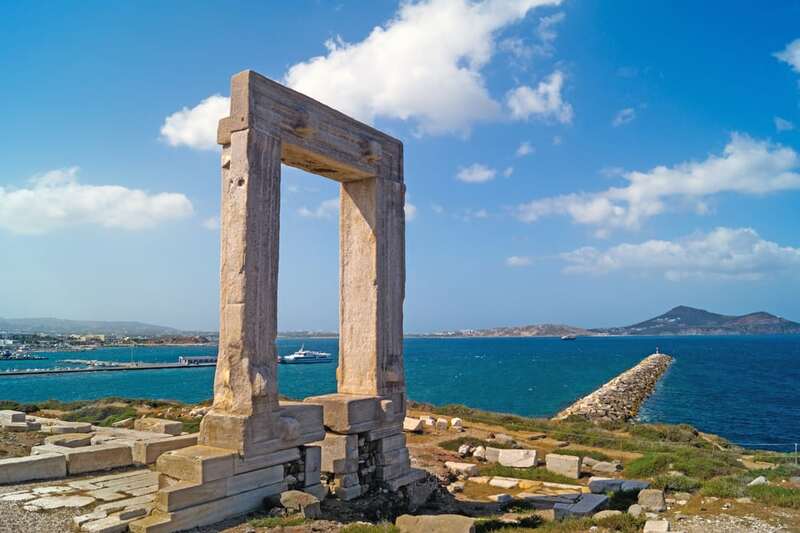 Naxos has been continuously inhabited since the 4th Millennium BC and excavations around the island bring to light ancient artifacts and buildings almost daily. 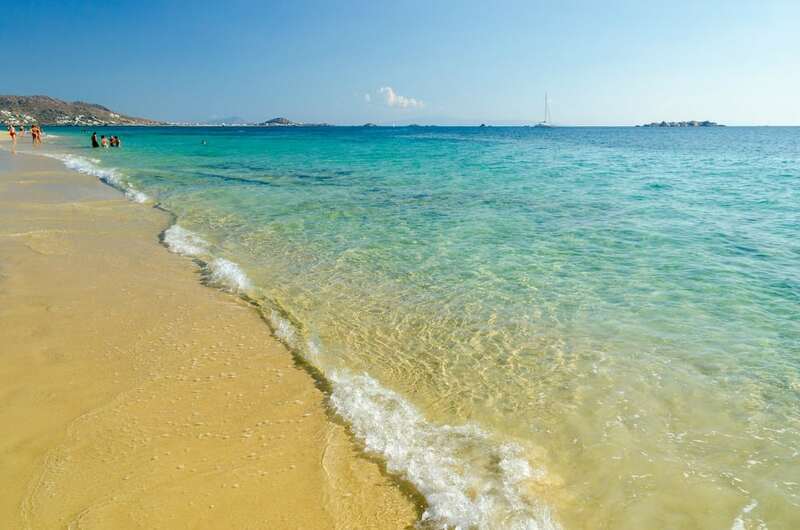 After check-in, you will have time to relax or swim in one of the greatest beaches of the island. Later in the afternoon, we will take a tour of the town of Naxos, Chora, and visit the islet of Palatia (Palaces) which is dominated by the enormous gate of the temple of the god Apollo, Portara, (as it is typically called by the locals). We will walk around tasting local products through the curvy, narrow streets and alleys of the old medieval part of town. It is quite like a labyrinth – you never know what you’ll find after the next turn! Today we will spend most of the day exploring Naxos. We will go on an excursion to the mountain villages of Naxos, a unique and indispensable experience at the same time. 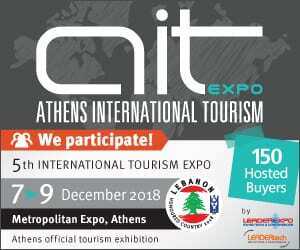 We will visit an exquisite old Citro distillery museum, the ancient Byzantine temple of Agios Georgios the Diasorritis, the Museum of Greek Coins, swim in an exotic and secluded beach, have a mouthwatering lunch at a traditional village and last but not least visit old windmills and an olive press museum. A day to relax and enjoy the lovely beaches. Breakfast, check-out and transfer to the port for departure on high speed/seajet ferry to Santorini. Check-in at your hotel and late lunch right on the water. 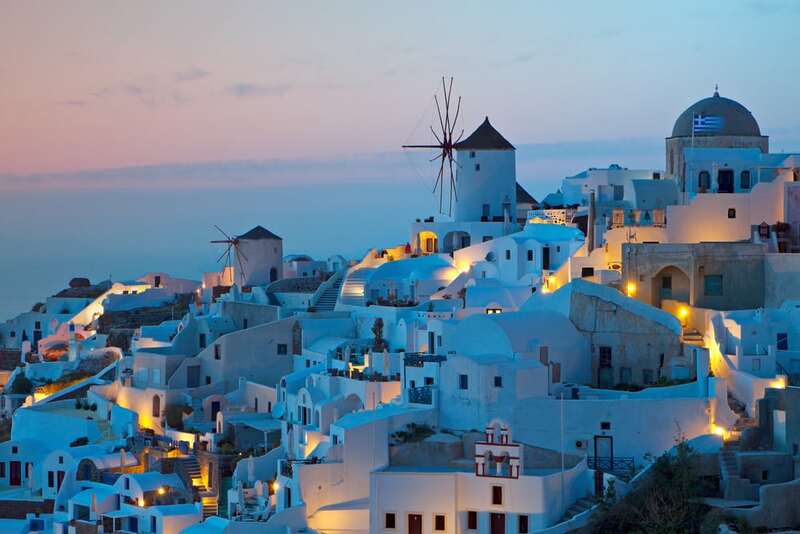 You are free in the evening to explore the town of Fira and capital of Santorini. Spend the morning relaxing in your suite or explore Oia.Oia is the most famous of all the villages of Santorini. It is known throughout the world for its quiet life and fantastic sunset and is certainly the most beautiful and picturesque village of Santorini. The village is also situated on top of an impressive cliff and offers a spectacular view over the volcano of Palia and Nea Kameni and the island of Thirassia. Oia is situated on the north of the island, 11 km away from Fira. It is a traditional village with charming houses in narrow streets, blue domed churches, and sun-bathed verandas. Its streets have plenty of tourist shops, taverns, cafes, and other shops. Oia is much quieter than Fira and the busiest area is the main pedestrian that runs along its length. 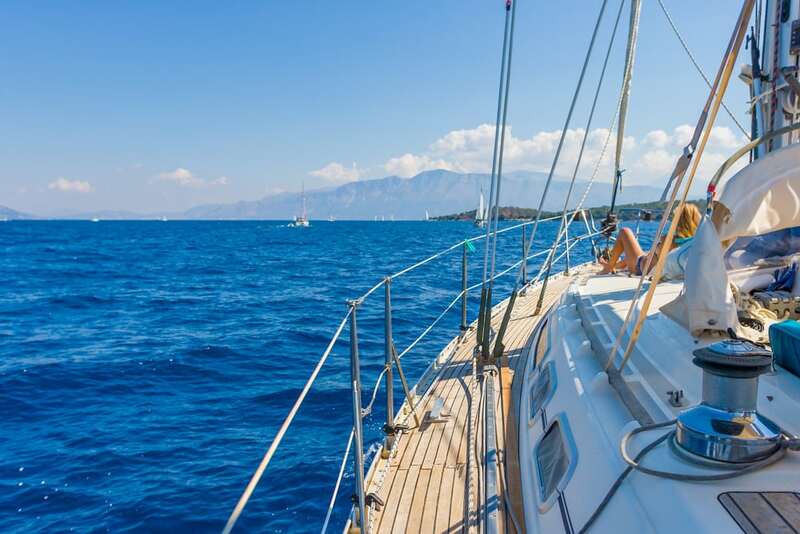 In the afternoon you will enjoy a private sunset sailing cruise and sail around the volcanic islands of Nea Kameni and Palea Kameni from where most of the volcanic layers are visible on the impressive steep inner walls of the Santorini caldera. We head for the “Hot Springs” and their thermal sulfurous waters, where you can let yourself indulge in the natural-warm and soothing sea. During the remainder of our voyage, our Santorini sailing boat docks close to Thirassia, the second largest of the complex of islands forming the Santorini caldera, giving you the opportunity to escape into its crystal clear and refreshing blue waters. While we’re enjoying the refreshing waters the captain and his crew prepare a delicious BBQ on board, served along with Santorini white wine. Next, we depart for the northern tip of Santorini and the town of Oia with its two small fisherman ports Ammoudi and Armeni. From our Santorini sailing boat, we have a unique vantage point for viewing and photographing the lovely traditional settlement of Oia. Here you can relax and enjoy the beautiful scenery. At this point, we set sails into the beautiful sunset. Day to relax and enjoy your hotel’s spa facilities in magical Santorini. In the evening you can take part in a Greek wedding show and live the experience of a ” Big Fat Greek Wedding ” and celebrate in the traditional Greek way. 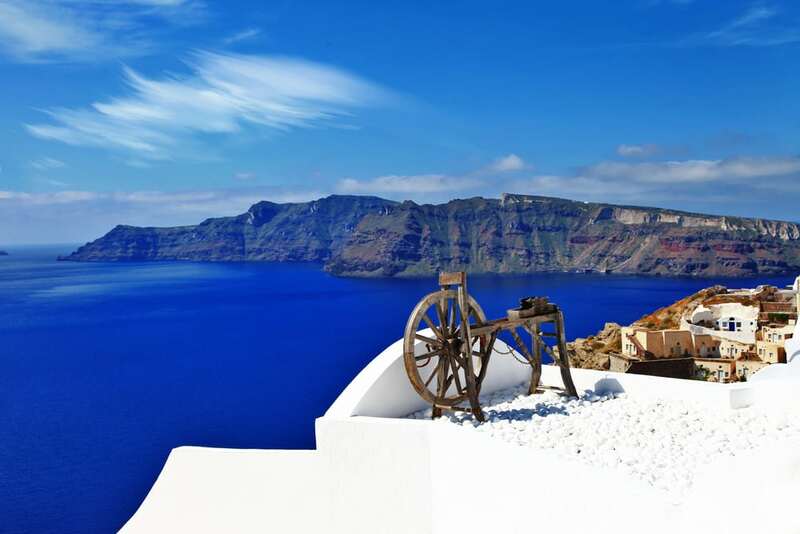 Enjoy a hike up to Ancient Thira, located between two black sandy beaches, or drive up to the location. Apart from the Ancient ruins, the view will really compensate you. Ancient Thira was inhabited from the 9th century BC until 726 AD. Originally founded by colonists from Sparta, it was a city-state with strategic value because of its two ports and excellent vantage point. Around the 2nd century BC, it served as a naval base for the Ptolemies from Egypt. Romans occupied the city in 1st and 2nd centuries. In the 3rd Century, the city started to decline. In 726 AD a small volcanic eruption covered the city in pumice and the city was abandoned only to be used occasionally in the 8th century as a refuge during Arab attacks. Several excavations have uncovered statues (which have been sent to museums), remnants of houses, temples, Roman baths, a road network, drainage systems, and a theater. Walk around with a licensed guide and let him walk you into the past. 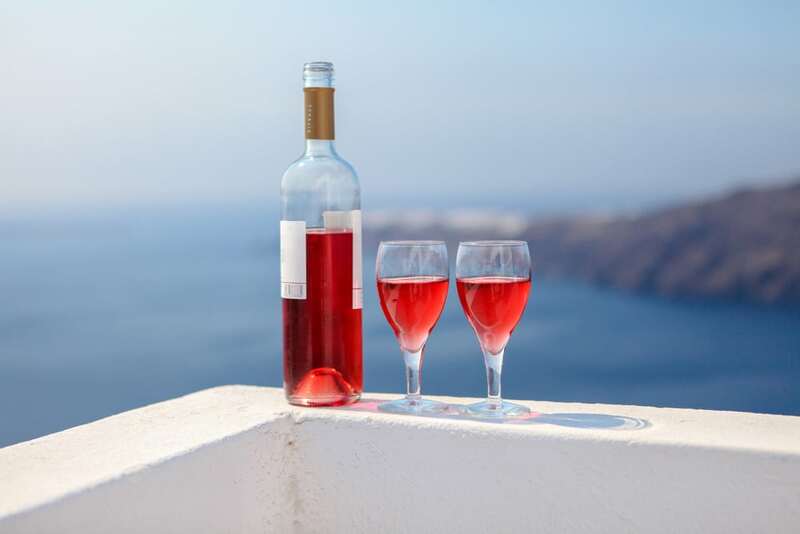 End your last evening in Santorini with a wine tasting tour and dinner. Our tour concludes after breakfast, with a departure transfer to the airport and a flight to Athens.